MoMo 2.0: At være??? To be??? Kender du hvem det er? Kender du hvor det ligger og hvad det er navnet? Do you know where this is and what the name of it is? Og mere vigtigt----kender du hvem det er?! And more importantly---do you know who this is?! Og mest vigtigt--ved du hvor Mads og jeg vil være på den 28. august? And most importantly--do you know where Mads and I will be on August 28? Jude Law kommer til landet til sommer for at spille hovedrulle i Shakespeare´s Hamlet. Hvor vil han spille? Hamlets Kronborg Slot, Selvfølgelig! Og hvem vil være der at se det? Mads og Kelli Nørgaard! Jude Law is coming to Denmark this summer to play the lead role in Shakespeare´s Hamlet. And where will be performing? 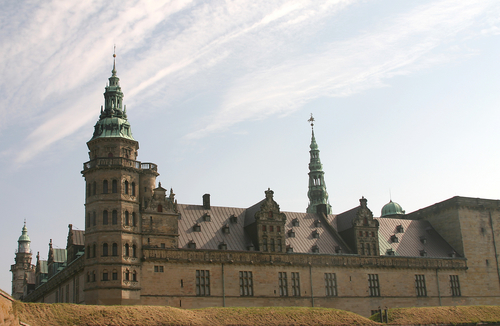 Hamlet´s Kronborg Castle, of course! And who will be there to watch it? Mads and Kelli Nørgaard! That's exciting! How much are the tickets? WOW! I'm green with envy! You lucky thing! Who will be playing Ophelia? Hey, hey hey...details! What do you mean you are 'watching' Jude Law perform Hamlet? How does one get to see that. Im interested! In Hamlet the Kronborg Castle was named Helsinore instead of it's real name Kronborg. Helsinore is actually the English name for Helsingør which is the town where Krobrog Castle is located. Paula-tell Thomas you want tickets for your birthday!!! we could have a double date! To answer to your questions , I do have a facebook page. My name is under Kimberly Leathers. And off topic ~ I read your blog about the smart cars. We have a few running around our neighborhood,and they are really neat. And while they are small they are bigger than what I thought. We read this my senior year of high school. All I remember was Ophelia drowning. I'm excited you get to see a flaming HOT Hamlet, though.... very nice! You guys win -- this IS the coolest thing ever! Steal his underwear for me will you? He is so so scalding HOT! Enjoy the performance you lucky girl! I saw Val Killmer play Hamlet at the Colorado Shakespear festival in Boulder back in...', 88 It was out doors too, But it is cool to see it in the "original setting"